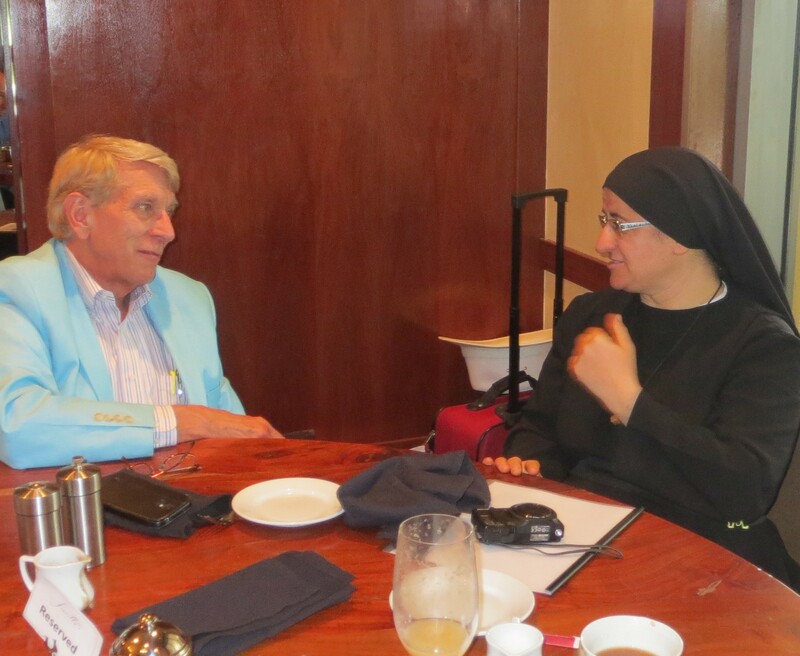 Sister Hatune Foundation – On May 13th and 14th I traveled to Orlando, Florida for the specific purpose of meeting Sister Hatune Dogan, an Orthodox nun, who has exposed the atrocities of the McCain/Obama supported “rebels” in Syria. Sister Dogan has received intense criticism and physical threats because of her work in Syria, although that is not her primary ministry. Sister Dogan’s ministry is literally worldwide and has given aid to as many as six million people over a period of decades. It is one of the largest Christian ministries in India, offering everything from safe-houses to abused women to food distribution and educational programs. Yet, because she is an Armenian Christian who was raised speaking Aramaic (the language spoken by our Savior) her heart is with the Syrian Christians. Even though the primary focus of Sister Dogan’s work is not in Syria, she has been accused of telling lies to support the government of President Assad. Her accusers claim she has made false statement about the “rebels” supported by the Obama Administration. The liberal news outlet HuffPost has been one of her many accusers in the United States, and even some conservative media that back war on Syria have attacked her. But the photos and videos she has presented do not lie. The truth of what is happening in Syria is so incredible that as you read the next paragraph your mind will force you to reject that these horrid acts of terror against humanity are being committed. Blood from slaughtered Christians is being bottled and sold for Muslim fighters and others to wash their hands in, to assure themselves a place in “paradise” with 72 virgins. Hard to accept, isn’t it. I have watched the video of a Christian man being decapitated with a butcher knife. It took several minutes to saw off his head. He lived for perhaps two minutes into his beheading with the butcher knife. Beheadings of Christians are meant to be painful, not swift. A basin was placed under his neck to catch the blood to be used for the fighters to wash their hands in it. Excited screams of Allah Akbar could be heard as the Christian man was beheaded. Many of those in the group watching the beheading were making videos of the procedure with their own cell phones, perhaps to send home for bragging rights. The video of the beheading was placed on the Internet as a recruitment tool to attract Muslims in Europe to come to Syria to fight Jihad and have the opportunity to kill “Kafir” or unclean Christians. This horrid video was exposed on LiveLeaks with translations although none were required. Just before the beheading a Syrian rebel explained the man’s crime – he had refused to renounce his faith in Christ. (Do not visit the LiveLeaks site EVER. I have to look at this stuff to write about it but 99.9% of human beings should never see such things. I also had the very unfortunate opportunity to watch videos of the actual crucifixion of two Christian teenage boys who refused to become Muslims. Sister Dugan brought these videos with her so I could perhaps show them to congressmen, to plead with them to stop American aid going to the “rebels.” The wrists of the two teenage boys were tied to crosses and then nails were driven through their hands, just as was done with our Lord Jesus Christ. One of the reasons I went to meet Sister Dogan in Florida was to talk to her about the slaughterhouse in Homs. A young man who was employed to bottle the blood had such nightmares that he fled the village and come to one of Sister Dogan’s safe houses to plead for forgiveness. These are not tales; they are real events. The young man got down on his knees before one of the Orthodox sisters and pleaded for forgiveness, and accepted Jesus Christ as his Savior and Lord from that moment on. He now works at one of Sister Dogan’s ministries in Lebanon. I have seen other photos and videos that I simply cannot share with you. I would not want any other human being to see what I have seen in these videos. I would not give someone this curse that causes me nightmares, knowing that my country, the United States of America supports the monsters who commit these crimes. It shames me as an American to know that we have aided them. Obama says we only give them food, and that we arm only the “good rebels.” Giving these monsters food so they can continue to kill is just as bad as giving them guns. A joint mission: As I mentioned above sister Dogan is an Armenian Christian who was raised speaking Aramaic. Her family fled persecution in Turkey when she was 15 and she later took the vows as an Orthodox nun. Besides Aramaic she speaks Turkish, Arabic, German, Greek and others for a total of 13 languages, all fluently. She also holds a nursing degree and a Master’s Degree in psychology. With Sister Dogan’s help we can reach even further into Syria to help individual Christians. At the same time she will be able to supply me with the information I need to convince more congressmen and Senators that the United States has switched sides on the “War on Terror” and now supports some of the same people who carried out the jihad attack against us on 9-11. Sister Dogan will be a continued blessing to our work with Syrian Christian refugees. Currently I am working to bring Sister Dogan to Capitol Hill in September to speak at various events and to meet with congressmen and Senators and tell them the truth of the horror Christians face in Syria today. Somehow we must stop this suffering and injustice. This did not surprise me at all – Congressman Mike Rogers (R-MI) was the keynote speaker at an awards dinner to honor the Ground Zero mosque imam, Faisal Rauf, and his wife Daisy Khan. The dinner was hosted by the International Center for Religion and Diplomacy (ICRD), which has ties to the Muslim Brotherhood. Rogers is chair of the House Permanent Select Committee on Intelligence. Rauf and his wife Daisy Khan are the forces behind the effort to build a super mosque close to Ground Zero in New York City. I worked diligently, as did many others, to stop the construction of the mosque at the site where some of the wreckage of the aircraft that slammed into the World Trade Center was found. It is more than likely that some human remains are at the site as well. I have even spoken at a mass protest led by Pamela Geller, a few blocks from the site. Congressman Rogers, who will not seek another term, is from Michigan, the capital of Islam in the United States. Dearborn, Michigan is now majority Muslim. The Select Intelligence Committee of which Rogers is chairman is notified in advance by secret communication from the Administration about any future military action, transfer of weapons or major CIA efforts. As a result Rogers was briefed in advance of Ambassador Stevens’ mission from Tripoli to Benghazi to transfer arms illegally to Syrian jihadists fighting the secular government of that nation. Of course Rogers was told that one of the ships carrying weapons for the CIA was the Lutfallah II which was later searched by Lebanese authorities, and heavy weapons were found. This is the main reason that the investigations into the Benghazi massacre have been so disorganized and fruitless. The Republicans want to look tough and want to make themselves look good, while at the same time making Obama and Clinton look hapless. Unfortunately, Chairman Rogers and other high ranking Republicans were in bed with Hillary Clinton on the whole arms to jihadists episode that ended in the death of the Ambassador and three others. The Benghazi investigation is now in the hands of Congressman Trey Gowdy of South Carolina. He is a solid conservative and his work experience before holding office was as a district attorney. However, he has no military, Foreign Service or intelligence experience. The inner workings of the CIA are a totally mystery to him, and the learning curve is steep. The whole Benghazi debacle could have been properly investigated and crimes exposed if Chairman Rogers were not so favorably disposed to the Muslim Brotherhood and so supportive of the efforts of Secretary of State Hillary Clinton to install the Brotherhood into power in Middle Eastern nations including Egypt and Syria. How deep is Rogers in with the Muslim Brotherhood? When Congresswoman Bachmann and four others called for an investigation of the Muslim Brotherhood’s infiltration into government agencies in the United States, he joined Senator John McCain in publicly attacking her. His inference was clear that anyone attacking the Muslim Brotherhood is a bigot. Please note that there has been no protest from the office of Chairman Rogers concerning brutality against Christians in Syria, or for that matter in any other Islamic nation, including the Sudan. Since he is chairman of the Select Intelligence Committee, I find that strange. A rare win in the courts – On Wednesday, May 28, the Second Circuit Court of Appeals upheld the constitutionality of the national motto, “In God We Trust,” on U.S. currency, in Newdow v. Peterson. The “Newdow” in the case is of course atheist Michael Newdow, the same man who once claimed his Christian daughter was offended by the words “under God” in the Pledge. You may recall that I wrote a book concerning the history of the Pledge of Allegiance to our flag and the attacks upon it. That book, The Pledge: One Nation Under God is still available. In January, 2013, the Freedom from Religion Foundation (FFRF) filed a lawsuit against the U.S. Treasury Department, claiming that the inscription of the national motto, “In God We Trust,” on U.S. currency is an unconstitutional violation of the Establishment Clause. Michael Newdow, who obtained a law degree for the purpose of attacking God in the courts, is closely associated with FFRF. In this case brought by atheist Newdow, the Second Circuit affirmed a federal district court’s dismissal of a challenge to the national motto, “In God we trust.” The court stated that the motto’s inclusion in the design of U.S. currency, which is required by statute, is “a reference to our religious heritage” and does not violate the Establishment Clause or the Religious Freedom Restoration Act (RFRA). This is the fifth time that the constitutionality of statutes placing the National Motto on currency has been challenged, and the fifth time atheists have failed. Similar court decisions have been issued by the Fifth, Ninth, Tenth, and D.C. Circuits. However, atheists like Michael Newdow hate the Lord so much they will continue the effort. 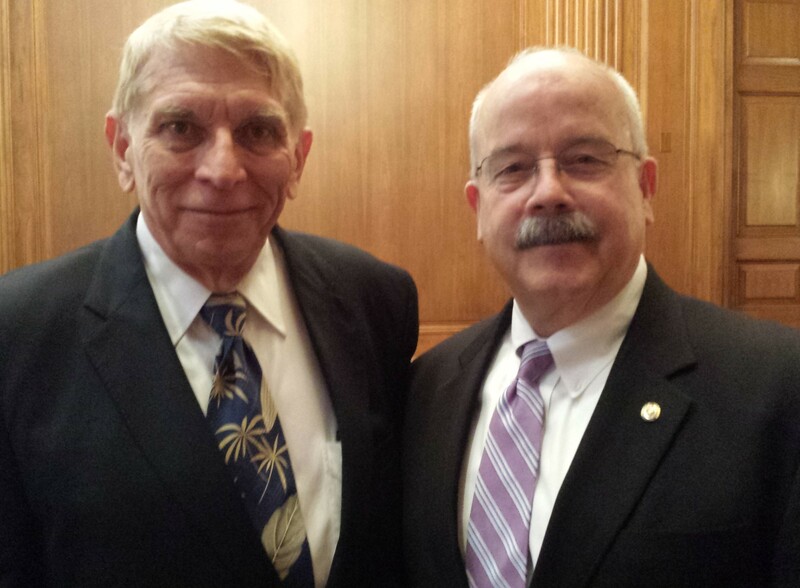 The Prayer Caucus in the House of Representatives played a part in this case. Forty-one members of the House of Representatives – all members of the Prayer Caucus – signed an amicus curiae brief to the federal district court, supporting the motto and articulating how “In God We Trust” is a reflection of the historical fact that America was founded on a belief in God. Some history – In 2001 I drove several hours to Virginia Beach to meet a young state legislator who was running for Congress to fill a vacancy caused by the death of a ten term Democrat, Congressman Norman Sisisky. The district was solidly Democrat and most saw no hope of Randy Forbes being elected. My political action committee, Government Is Not God, backed Randy Forbes who ran on a ticket of morality and was unafraid to publicly stand against abortion in a blue color Democrat district. He won with 52% of the vote. Congressman Forbes went on to establish the Prayer Caucus, which now has 100 members of Congress and has become one of the most powerful caucuses on Capitol Hill. Capitol Hill Top Cop: Not all of what I do on Capitol Hill has to do directly with elected officials. On May 16th in the Capitol Building’s Mansfield Room, I participated in a special retirement breakfast for Terrance Gainer, the 38th Sergeant at Arms of the U.S. Senate. Besides having the responsibility for security in the Capitol, the Sergeant at Arms escorts the President into the House Chamber for joint sessions of Congress. In fact, the Sergeant at Arms of the Senate is the only man empowered to arrest the President of the United States should that be ordered by the Senate. Previous to holding this position Gainer was the Chief of Police of the U.S. Capitol Police Force. Terrance Gainer is far more than a “top cop.” In private he talks most about being a deacon in his church and about the many times he has been able to be of spiritual help to the men who have served under him. It was my honor to sit with him at the breakfast, discuss the Lord with him and to pray for him as moved on to other goals in his life. Will Syrian Christian refugee kids have a Christmas this year? Christmas for Refugees: Much progress is being made in preparing to expand our Christmas program this year. For more than a decade we have worked almost exclusively in Jordan with both Iraqi and now with Syrian Christian refugees. While tens of thousands of Syrian refugees have headed to Jordan, the overwhelming majority go to Lebanon for various reasons including the proximity of the border to larger cities. Because Lebanon has a much larger Christian population than Jordan, it is there that Christian refugees more often try to escape. In Lebanon, Christian relief agencies can operate more openly than in Jordan because there are entire regions of the nation which are majority Christian. There is now an opportunity with the Christmas program to move forward, due to contacts there that I made on my last visit. As we get closer toward Christmas, I will keep you informed of how the program is progressing. Read more. Please continue to support the various projects of the RFC ministry this month, both those in the Middle East and my work here in Washington, DC. Donate today!